High-quality workbenches offer durability at an affordable price. Welded 13-gauge steel legs support 4,000 lbs. per pair while the large worksurface in your choice of material gives you plenty of room to complete job tasks. Choose either 32"H fixed legs or adjustable legs that raise from 27-7/8" to 35-3/8"H in 1-1/2" increments. Color: gray. IN STOCK. Includes top, legs, and stringer. SPECIFY LEG HEIGHT: A - 32" fixed, B - 27-7/8" to 35-3/8" adjustable. 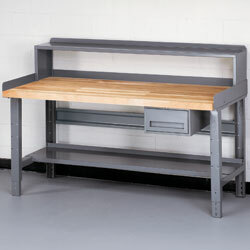 Self-contained unit may be stacked on top of bench or mounted underneath. Nylon roller bearings for ease of operation. Includes padlock hasp, drawer divider, and removable tray. SIDE AND BACK RAIL KITS. 3" height prevents parts and small objects from falling off the sides and backs. Used for extra storage 16-gauge construction. 14" deep. Adds extra storage at a convenient height. Riser is 12" high and 10-1/2" deep. Stabilizes bench legs. 14-ga. units bolt to legs. 32"H. All-welded 13-ga. steel with 14-ga. cross members and pre-punched flared feet that can be bolted to floor. Priced per leg. Adjusts from 27-7/8" to 35-3/8" high in 1" increments. 14-ga. steel uprights with 13-ga. top members. Priced per leg. STEEL TOPS. 1-1/2" thick 12-gauge steel with 14-gauge reinforcement channels at each end. PLASTIC LAMINATE TOP. 1-3/4" thick high-pressure plastic laminate with a non-conductive smooth surface. “BUTCHER BLOCK” MAPLE TOP. 1-3/4" thick solid laminated maple that can be sanded smooth. DURATOP II. 1-3/4" thick phenolic tempered hardboard over a MDF core. Phenolic resincore surface resists conventional liquids. PLASTIC LAMINATE W/BULLNOSE TOP. High-strength lumber core with high-pressure laminate surface. 180° radius front edge. YG-4696 12	 30" x 48"
YG-4698 14	 30" x 60"
YG-4700 15-1/2	 30" x 72"
YG-4701 16-1/2	 36" x 72"
YC-3089 Wt. 15.2 lbs. 28"D.
YC-3090 Wt. 15.4 lbs. 30"D.
YC-3091 Wt. 15.8 lbs. 34"D.
YC-3092 Wt. 16 lbs. 36"D.
YC-3093 Wt. 17.3 lbs. 28"D.
YC-3094 Wt. 17.5 lbs. 30"D.
YC-3095 Wt. 18.5 lbs. 34"D.
YC-3096 Wt. 18.7 lbs. 36"D.